Our School of Religion strives to be a “family-centered” program. We partner with parents to nourish and develop children’s faith according to the basic principle defined by the Church: Parents are the primary educators of their children. 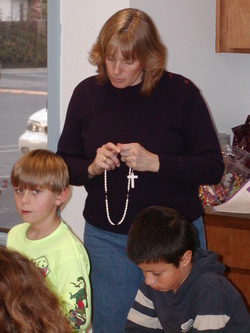 Our classroom volunteers work to support the efforts of parents, but we assume that parents are the primary educators of their children in the faith, teaching both traditional prayers and the art of prayer, attending Mass every Sunday together as a family, and leading them in living a life a charity. We work with students with learning disabilities and also offer a Special Education class. Is God calling you to serve as a catechist (a teacher of the faith)? If you think you might be called to this work of the Church please contact Debbie Greco. Confession Basics: How to make the most of the Sacrament of Confession. As part of Sacramental preparation of students through the St. Joseph’s Parish School of Religion, one of the student’s parents or guardians must attend a monthly class on the basics of our Catholic Faith. There are eight classes in the year-long series. Attendance is a requirement of all parents regardless of background or qualifications. • in their first year of preparation for the Sacraments of Initiation (Baptism, Confirmation, FHC). The classes in this program must be taken in consecutive order—beginning with September and ending in April. If the parents do not attend each of the eight monthly subjects in the School of Faith in consecutive order they will be required to restart the program the following year. Completion of the program is required or the Candidate’s celebration of First Holy Communion and or Confirmation will be deferred until the parent fulfills this obligation. Each month there are 11 opportunities to attend the class. Home-schooling parents are also required to attend the eight classes in the School of Faith. The start of this program applies to parents whose student is in preparation for the sacraments of Confession or Confirmation. First Holy Communion is received by elementary students at the end of their third year of catechesis, following the completion of this requirement (School of Faith) by at least one parent. There is no charge for this program. Parents whose children are in the first year of classes are not required to take the School of Faith classes in this first year enrolled. However, parents with "first year" students are strongly encouraged to take the classes in the first year so that if there are difficulties in completing the 8 classes in the first year they would be able to restart and complete the classes in the following year. As primary educators of their children, parents are what make the home the first and best place for children to become well prepared to receive sacraments for the first time (and beyond). The example and advice of parents, along with their prayers and love are what really help kids to be “ready” to receive sacraments. This course provides practical ideas, advice and guidance for parents as they take an active role in preparing their children to receive the sacraments. The program consists of eight meetings. Parents must attend one meeting each month during the school year. The program is designed to meet the needs of our parish’s many busy families. Please take a moment to look over the schedule for the year. We will work with each and every family to ensure that at least one parent from each home is able to attend all eight meetings through the year. If one parent has completed an equivalent education program they may submit documentation to the DRE for consideration and possible approval. Because of how important your attendance is to the success of your children’s religious education and preparation for reception of sacraments, this program is mandatory and will be part of our consideration of readiness to receive sacraments. We recommend these sites to learn more about the Catholic faith. Dr. Ray Guarendi - the one and only Dr. Ray on discipline, discipline and more discipline! Fisheaters Domestic Church page - traditional information on how to make your home a "domestic church"
One way members of St. Joseph's live out their Catholic Stewardship is by teaching the faith to children and adults. 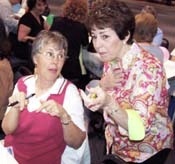 In Catholic language teachers are called catechists. The catechist is a person who "echoes down" the faith they have received from the Church to the next generation of believers. This work involves knowing God better ourselves so that we may make Him better known by others. Knowing God involves a relationship. God reveals Himself to us and we respond to this gift as thankful stewards of His providence. For more information read our Volunteer Catechist brochure.